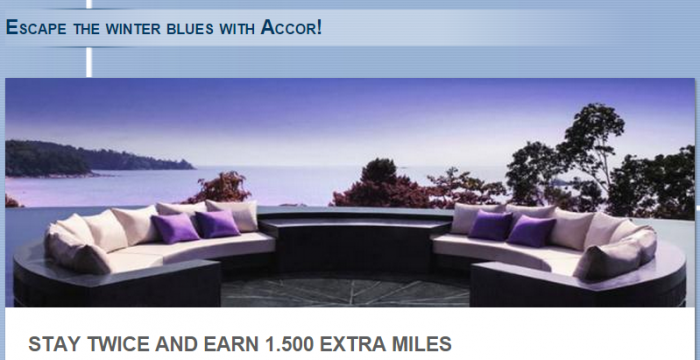 Le Club Accorhotels has launched new bonus miles offer for Lufthansa Miles&More members that can earn 1,500 bonus miles. This offer is valid for stays between February 1 – March 31, 2015, and the booking must be done in February 1 – 28. You earn 500 bonus miles for your first stay and 1,000 bonus miles for your second stay during the qualification period. Great that the airline related bonus offers are coming back in 2015. Let’s hope that there are as juicy offers as in the late 2014 coming up with Aeroplan and British Airways. In order to earn miles automatically after each qualifying stay in a hotel participating in the Le Club Accorhotels program, you must be members of the free Le Club Accorhotels loyalty program. Miles & More participants who are already Le Club Accorhotels members and who wish to earn award miles directly after each stay, must select Miles & More as their preferred reward partner in their Le Club Accorhotels online account and activate the direct earning function via this link. With this offer members earn 500 extra miles for the first stay and 1.000 extra miles for the second stay within the promotional period. A stay is defined as one night or several consecutive nights in the same hotel: At least 1 night with Sofitel, Pullman and MGallery, at least 2 nights at Novotel, Suite Novotel, Mercure and Adagio and at least 4 nights with ibis and ibis Styles. In the case of consecutive stays in the same hotels, these stays will be counted as a single stay. Miles will be credited to your mileage account approximately 2 weeks after your stay. The offer may be modified and interrupted in whole or in part at any time and without prior notice. The offer cannot be combined with any other promotion.The general terms and conditions of Le Club Accorhotels apply. Next articleFALSE ALARM: IHG Rewards Club “Enhances” Royal Ambassador Point Earnings At InterContinental Hotels By -25%?